Google Voice is a way to have a new phone number with new features without changing your existing phone service, and it’s free. Simply put, it’s another surprisingly free cloud-based service that Google provides to its users. Google Voice does have some competitors, at least in a certain sense. 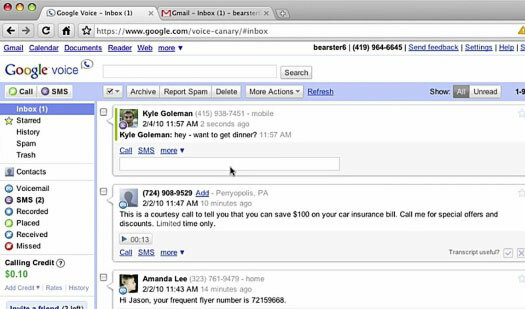 One of the main attractions of Google Voice is free calling and texting within the US, provided that you have an internet connection, a microphone, and speakers. Skype does one better than that, allowing you to make free calls with the same equipment to anywhere in the world, but there’s a bit of a catch. Skype can’t make free calls to cell phones, but Google Voice can. That’s as far as competition goes, though, because most everything else that Google Voice can do hasn’t really been done before. Allowing you to have one phone number that will reach you through any of your phones and sending you emails containing written versions of any voicemail you missed are features that, so far, are unique to Google Voice, at least in the consumer space (and especially for free). And that’s not all that it can do. But just because it can do a lot doesn’t mean that it appeals to everybody. While most people can appreciate the idea of one phone number, setting it up can seem daunting. Not because it’s hard, but because the average person isn’t going to understand how it works. Google does make the process fairly easy, but that doesn’t eliminate the appearance of difficulty before the user ever begins the process. On top of that, lots of people only have one phone: their cell phone. For those people, the biggest feature doesn’t amount to much at all. Still, once someone dives into it, the most appealing features are easy to set up and enjoy. It’s some of the other stuff, the deeper features, that won’t draw your mother-in-law into creating an account. The ability to respond to the same text message either through your phone or through your computer is something that appeals much more to the tech savvy crowd. And for those people, it generally all boils down to what the system can do. Well, what all can Google Voice do? When someone calls your Google Voice number, you can have it forward to more than one phone simultaneously. When you pick one up and begin a conversation, the other phones stop ringing. This lets someone reach you no matter where you are with only one phone call. On top of this, the number forwarding will allow you to forward the number to specific phones, or even no phone at all, depending on who is calling or what time of day it is. When someone calls your Google Voice number (which you pick out when you sign up for it), they can leave a message if you don’t answer. When they leave a message, Google Voice does everything it can to turn that audio-only voicemail into text, which it then sends to your email address. This allows you to see what the person wanted without having to make any disruptive calls. You can set it up so that different people get a different message when they reach your voicemail. For example, you can give a friendly greeting to your friends while still giving a professional greeting to your business partners or people who aren’t in your contact list. If someone leaves a voicemail on your Google Voice account that is meant for you and someone else, or perhaps if you simply feel like sharing what the voicemail said, you can send the voicemail to a friend’s email account. For as low as $0.02 a minute for many countries, you can use Google Voice to make international calls through the internet or through your cell phone. They also give you a free $0.10 when you create a Google Voice account. I know, it’s not much, but it is a free 5 minutes to a lot of countries. You can view, and respond to, text messages that are sent to your Google Voice number either on your phone or online in your Google Voice account. If you want to, you can set it up so that the text messages are also sent to your email account. If you do that, you can respond to the text messages through your email as though it was a normal email. It will then be converted back to a text message and sent to the person who originally sent you a message. You have the option of sending a caller to voicemail to see what they want to talk with you about before you answer. You can easily join the conversation whenever you want, or you can ignore it and keep the message in your voicemail inbox if you so choose. If you want someone to stop calling you, you can easily block them using Google Voice. Once they have been blocked, if they try to call you again, they will get a message informing them that your number is “no longer in service”, which will only be true for them and anyone else you decide to block. If someone calls you while you are already speaking with somebody else, you can add them to the call to create a conference call by pressing 5. This way, not only is it easy to set up conference calls (you won’t have to remember long access numbers), it’s also free. You can make all of the above functionality even easier to access and use by downloading an application for your phone which will integrate Google Voice into your native dialing features. All of these features, except for the phone applications, work for any phone that can normally make calls and receive text messages. And as an added bonus, if you ever change cell phones or service providers, it won’t matter if you keep the same phone number, because you can just change some settings in your Google Voice account to make everything work on your new phone. It’s definitely all impressive in theory. It does, however, come with a few annoyances. The call screening ability means that you’ll always have to press either 1 or 2 every time someone calls. You can’t simply pick up, unless you turn off this feature altogether. And, of course, if everyone already has your current phone number, you’ll have to tell them your new Google phone number, at which point they’ll ask you why you have a new number. The last part is either good or bad, depending on your view. If you’re excited about Google Voice, then you probably won’t mind repeating the explanation to all of your friends. If you aren’t all that excited, it can definitely be annoying. Still, overall, that is a lot of features that are all completely free. The positive aspects definitely outweigh the annoyances in this one. Steve's interests lie mostly in Japanese games. He imports Japanese games and reviews them on his Japanese Game site Kuromatsuri.com. worst call service i spend 10 dollars to call pc to phone but was not able to call for even 1 minute bad bad …. Found your review via Google. Thanks for the hands-on, honest review. I’m contemplating using GV for my future business needs. You say that Google can forward calls based on the time of day, but I cannot find that feature any where in Google Voice. Signed up for Voice today. It allows me to to make calls from the US to my boyfriend in Colombia using my mobile phone. Easy to use. Clear connection. Much less expensive than international phone service (just 7-cents a minute to call a mobile phone), and less hassle than calling cards. So far, so good. Go to “Settings” and then “Voice Settings”. You will be on the phones tab. If you haven’t added a phone already, add it. If you already have a phone added, click on the “Edit” button underneath the phone number. Once you’re on that screen, click “Show advanced settings”. One of the options it will reveal is “Ring Schedule”. That’s where you can change call forwarding based on the time of day. What’s good about Google Voice is it reroutes a maximum of six phones to one. Google voice can transcribe voice calls to messages for the user to be able to get back to voice messages in an instant. The down side I see with this is its focused on incoming calls. When it comes to outgoing calls, most are a question. recording messages are good for incoming calls, but are a problem when it comes to outgoing calls. I’ll be looking forward to the updates that this service will offer. I’ve been toying around with GV for awhile now, and the one feature not mentioned here is the fact that GV works great when you get into a dead spot with cell service. I try making cell calls from my basement and the signal is very weak. So I plug in my headphones with a microphone on it and dial away via the computer. GV calls are much clearer then cell calls anyway because of VoIP. The one number feature will come in handy for some, and won’t matter to others. Definitely a user preference thing. I’m planning on setting up GV on a computer at home, next to my Magic Jack for when my son is home by himself. When Magic Jack fails (which it seems to do a lot) I would imagine the GV on the PC will ring instead.